How do you turn your dreams into reality? How do you make things happen for you, rather than let things happen to you? Don’t be humble about who you are and what you are capable of. Stand tall and stand out. Be known. Be recognized as a leader, and most of all, know you are a leader,” is Susan Bulkeley Butler's call to action for her readers to take responsibility for their lives. In this updated second edition of the best-selling Become the CEO of You, Inc., Susan has provided strategies for improving your life and new techniques for advancing your career. The book is focused around her “Make it Happen” model, which is based on three decades of experience working with Fortune 500 companies. The steps include: Develop a clear aspiration for You, Inc.; build your board of directors; develop your plan to make your aspiration happen; and navigate your day-to-day journey. 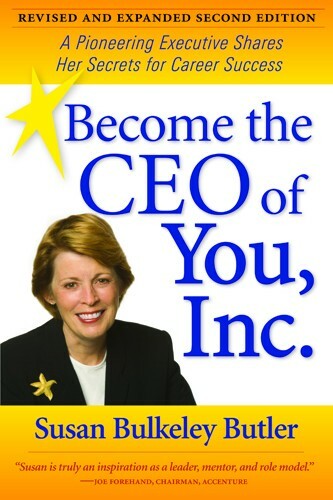 The second edition is completely revised and includes new topics such as: The importance of executive coaching; developing your image in today’s world; taking a long-term view of your life and career; new opportunities for balancing career and family; use of social networking techniques . . . the good, bad and ugly; and preparing for promotion. Susan Bulkeley Butler is CEO of The Susan Bulkeley Butler Institute for the Development of Women Leaders. Prior to founding the Institute, Susan established herself as an accomplished business leader who shaped her career at Accenture, the world's leading management consulting, technology services and outsourcing organization. She joined Arthur Andersen & Co. as its first professional female employee in 1965, and 14 years later, was named the first female partner of its consulting organization, Andersen Consulting, now known as Accenture. Before her retirement in 2002, Susan was the Managing Partner for Accenture's Office of the CEO for Chairman & CEO Joe W. Forehand. Susan served on Accenture's Executive Committee, the company's principal advisory and strategy-setting committee, and as President of the Accenture Foundation.